The Paschal [Easter] Greeting in various languages! English: Christ is risen! / Indeed He is risen! Arabic: Al-Maseeh qam! / Háqqan qam! Greek: Christós anésti! / Alithós anésti! Slavonic: Christós voskrése! / Vo-ístinu voskrése! Romanian: Christós a inviáht! / Adevarát a inviáht! Hungarian: Felta’madt Krisztus! Valo’ban felta’madt! 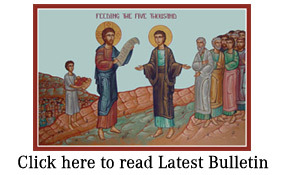 PDF of St Athanasius bulletin 20.4.14 PASCHA SUNDAY has many interesting articles in addition to the liturgical schedule. PASCHA. THE GLORIOUS FEAST OF THE RESURRECTION OF OUR LORD, GOD, AND SAVIOR JESUS CHRIST. MON. APR. 21 BRIGHT MONDAY. [SOLEMN HOLY DAY]. TUE. APR. 22 BRIGHT TUESDAY. [SIMPLE HOLY DAY]. WED. APR. 23 BRIGHT WEDNESDAY. THE HOLY AND VICTORIUS GREAT MARTYR GEORGE THE WONDER-WORKER. [SIMPLE HOLY DAY]. 7 PM WELCOME OF THE ICON OF THE THEOTOKOS OF JASNA GORA. AKATHIST HYMN. THU. APR. 24 BRIGHT THURSDAY. FRI. APR. 25 BRIGHT FRIDAY. The Holy Apostle & Evangelist Mark. SAT. APR. 26 BRIGHT SATURDAY. SUN. APR. 27 THOMAS SUNDAY.